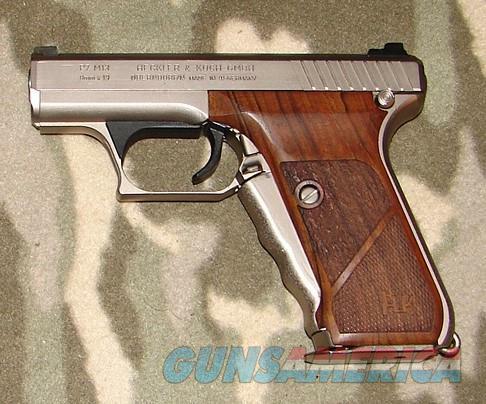 Description: Heckler & Koch P7 M13 Semi-Auto Pistol serial #17-82458, 9mm, 4 1/8" barrel with an excellent bore. This 1989 proof-dated Sterling, Virginia pistol retains about 99% factory electroless nickel plate with a few minor handling marks. The checkered and stippled walnut factory grips with H&K logo rate excellent with a few minor handling marks. The pistol is equipped with three dot windage adjustable night sight that no longer glow. The pistol also features a lanyard loop, frame mounted ambidextrous magazine release and heat shield in the triggerguard. Included is a single electroless nickel-plated thirteen-round factory magazine. This gun remains in wonderful condition and is a nice variation of the "squeeze cocker" for the P7 collector.